Despite the obvious appeal of vending machines -- quick service and zero interaction with other humans -- most of the cash-gobbling disappointment machines leave a lot to be desired, to put things nicely. Well, along with the "pizza ATMs" spreading across America, it looks like another type of vending machine that's actually worth a damn has arrived: a champagne vending machine. That's right, folks -- a vending machine that dispenses bottles of champagne, you know, like from in your dreams. The machine -- the only one of its kind in the US -- is from French champagne giant Moët & Chandon and is currently available to guests in the 23rd floor Sky Lobby at the Mandarin Oriental Hotel in Las Vegas, according to a report by Travel & Leisure. It's stocked with mini bottles (enough for a glass and half or so) of both the champagne maker's Imperial Brut and Imperial Rose. Here's how it works: visitors who want to grab a bottle of bubbly from the machine are required to pay with Moët-branded gold coin that's available for $20 at the hotel's front desk, where staff will presumably check for ID. In case you're wondering, the machine manages to dispense the bottles of champagne without shaking them. 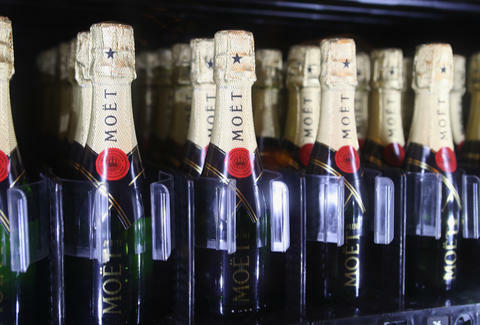 Perhaps best of all, each bottle comes with a flute so that you can start drinking without delay. The damn thing's in Vegas, after all. But then again, you can always just go out and buy a full-size bottle and spare yourself the absurdity of inserting a giant gold coin into a champagne vending machine. We won't judge either way. OK, maybe just a little. Tony Merevick is Cities News Editor at Thrillist and just remembered he has a bottle of champagne in his fridge. Send news tips to news@thrillist.com and follow him on Twitter @tonymerevick.